Do you ever wonder where you fit in the world of blogging? I do, on an almost weekly basis. I mean it can all be so dizzying. What do I want to focus on? Who do I want to reach? I see beautiful rooms like this. and I am in awe and I am amazed and I sigh. Will people read my posts knowing that I am currently living in my 88 year old mother's guest bedroom? I read posts about sweet romantic relationships. and I think how wonderful to see such amazing love. But, I left my husband, who had become seriously mentally ill, 24 years ago. I raised two daughters by myself and I struggled. I don't want to dwell on that struggle. I enjoy living in the now. I am amazed when I see how creative people are. I just think WOW!!! 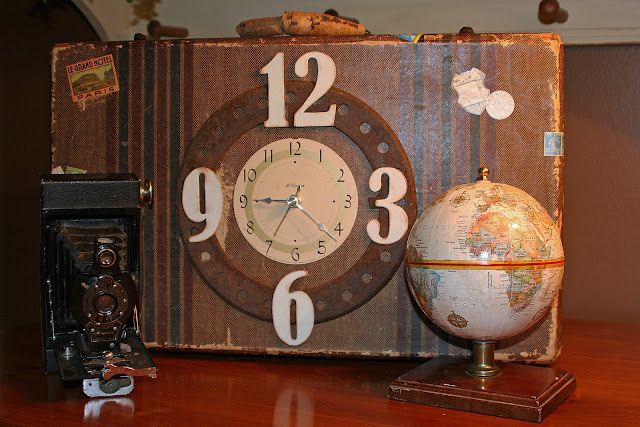 What imagination it takes to create a clock out of an old suitcase and other vintage parts. I'm not sure what my blog is about sometimes. I'm a pretty eclectic girl. I am humorous, serious, love my family, like to read recipes and sometimes cook them, a great advocate for women's rights, like to decorate, love vintage and antiques.......... Well, you get it. So I move on through this hardscrabble life. After all, I have made some amazing blogging friends who send me well wishes when I have surgery, who congratulate me when I get a new grandchild, and who make me laugh, and think, and dream. 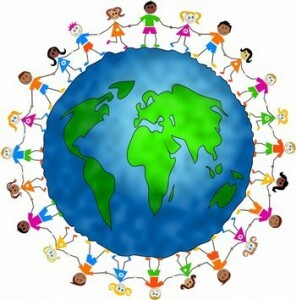 We are all a part of the great big blogging world. It's a world that I love being a part of, and even though I may never have the biggest, fanciest, most read blog. I have you and you inspire me every day. I really do love is a post like this one which lets me know I'm not the only one who feels this way. I know exactly how you feel. I'm not always sure where I fit in or if I do. I'm just here. Thanks for sharing. I feel better. I find that I most enjoy eclectic blogs and the ones where not everything is always perfect. It's more like real life. It makes readers feel more like friends when they see the writer's struggles as well as successes. I like to see the "pretty pictures" as much as the next gal, but I know my own life and home are far from perfect. And that's okay! I think a lot of us feel the same way. Sometimes I wonder who would even care about what I've got to say? So I just write about what I've been doing because it inspires me to be sure to go out and DO something to write about. Whenever someone takes the time to leave a nice comment, well, it makes my heart sing. And if I can make one person smile each day, then that's what makes me happy. You inspire so many without even trying. I hear ya and totally understand what you're saying! Thanks for sharing what we all feel at times. I love the big blog that brings friends right to my door. I am so thankful for them. Your pictures of clean, elegant rooms always give me a good sigh, and the old-fashioned items you promote take be back to a very happy time. It's a great combination. I think you fit extremely well into the world of blogging. Just keep being you. Wouldn't it be terribly dull if all blogs were alike? Everyone has their own unique voice and I believe there is a spot for everyone. I like the fact that you are honest and real. Just be yourself! Laura, those who blog, and live in the real world have something to share, it's how they live their life, and how they keep creative. We can all learn from that. Obviously eclectic is wonderfully endearing to so many of us, you have a huge following, so you are doing a lot of things right. I look forward to reading your posts, whether or not you live in a beautiful home,or a guest room...it's the "you" that I read in your blog. 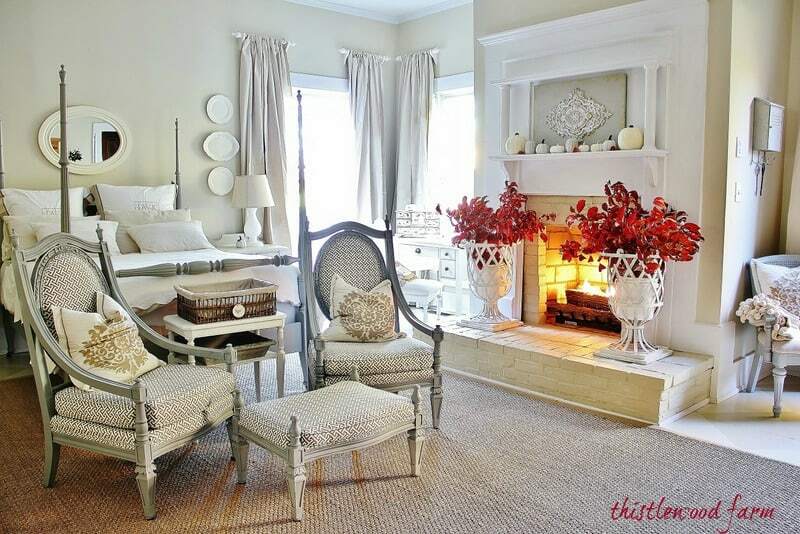 Keep it up, there are many rooms in blogland, enough for all of us to decorate in our own signature style. I know exactly what you mean. Love visiting your blog! I think you fit in just perfectly with the rest of us! Love reading your blog every day and am always inspired- thank you. I know exactly what you mean. Honestly, I'm here at your blog because I want to be, I enjoy it, no matter what you post about! What a wonderful post!! I'm a loyal follower of your blog. I'm eclectic, too, so your style suits me just fine. I love your blog because of the diversity of subjects! I have become really bored by some of the big bloggers that do one thing. Once I've seen something a hundred times, I tend to lose interest. I enjoy your day trips and photos. I care about the outcome of your surgeries. I am thrilled that you shared your beautiful new grandbaby with us. We all feel this way sometimes, Laura. I know I do. Your authentic self shines thru~ and you are wonderfully enough! That is a very interesting post Laura. I was wondering there for a second where you were going with it. Sometimes I feel the same way and I have only been blogging for half a year. Life has it's ups and downs but I do know I love being able to vent about those ups and downs in a blog format. The friends I have made here (including you)are so amazing. Yes, we are in a large blogging world. I really appreciated your candor and your honesty. Let's all work together, I'm game. You? Oh and last week when you couldn't get into my blog, I was messing around and didn't realize I had basically 'closed' my blog. doh! It is up and fine. lol. Isn't Thistlewood Farms so talented? I like her stuff! Awwww......I love your blog. No need to compare it to others. I think everyone brings their own personality and talents to their blog. If everyone was juat alike, it would be a pretty boring blog world out there. I'm so sorry to hear about your past struggles. I had no idea. I try not to compare myself to others because I believe that we are all on the journey that we're supposed to be on (in God's eyes), so try to celebrate what you have and not what you don't! And just when you think this is the way your life is, so accept it, a change is right around the corner. I know what you're saying! I think a lot of us have troubles which is why I blog-- gets my mind off that road! I'm grateful to have this hobby of sorts. And I agree with the other comments about how boring Blogland would be if we were all alike! I feel like you're reading my mind. I find it better if I just do my own thing and don't visit too many new blogs. I still like visiting the blogs that I love because, well, I love them. But if I start looking at blogs on people's sidebars and start visiting all them then I just start going down that rabbit hole of envy. There always seems to be someone who is up and coming and doing awesome things that I just don't have time for. Hey, wait a minute! You are like my blogging guru. I love the way you do your posts in such a classy style. 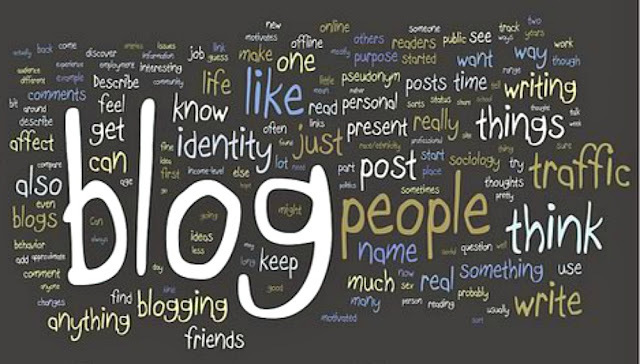 Keep blogging-- love reading your comings and goings. It took me a long time to figure out that we are all just trying to do the best we can.